Timecode is a simple way to sync Multiple Cameras and or Audio Recorders quickly with frame accuracy. Cheaper consumer cameras may have an option to reset timecode within, but after a short period clocks begin to drift apart between your different cameras. This is because they don't have accurate internal clocks. And though they may have an option to send timecode out (over HDMI), they don't have a way of getting timecode in from an external accurate Timecode Generator. Tentacle Sync Timecode Generators solves this problem by working as an external clock and embedding timecode into one channel of audio. This will essentially work for any type of camera with an audio input such as a Panasonic GH4 / GH5, Sony A6300 / 6500, and can even work with a GoPro. This can even be setup to work with tiny cheap audio recorders like a Zoom H1. Once you have each of your equipment 'listening' to an external clock, it doesn't matter how often you start and stop video across multiple devices. The Tentacle Sync (clock) is continuously running for up to 40 hours, and every recording you begin will have accurate time embedded into the audio or video file (metadata). Depending where you want to send this timecode, they have a number of different adapter cables from XLR, BNC, USB, TA3, Lemo, cables for RED + Arri Alexa cameras, and even works when recording with iPhones - (all found here). The first comment people have is 'Just use PluralEyes', which works great to sync files by analyzing each camera's recorded audio. But there are many situations where your cameras won't share the same audio. For instance, projects like reality shows where one camera may be inside a car and another across the street. Or when covering sporting events from different sides of a stadium where you're picking up random conversations (screaming + yelling) from a crowd. A few years ago, I once helped to cover an event on a Golf Course. Believe me when I say there's not a lot of audio captured in each camera to use as scratch audio for sync. Often we had cameras set a distance away from the Golfer and cameras on the other end of the course (to watch the ball drop). Because there was always distance, wireless audio had too many drop outs and too much interference. So for talent audio we opted to use belt worn portable audio recorders. Needless to say, attempting to sync all of the audio and camera angles in post was not an easy task. This would have been much easier had we worked with timecode. Keep in mind that Tentacle Sync can be used for Timecode Audio, but for many professional cameras like the Ursa Mini, Sony pro cams, or higher end audio recorders, Tentacle Sync can be used to embed timecode into the metadata of the files recorded. It can be used in different ways. 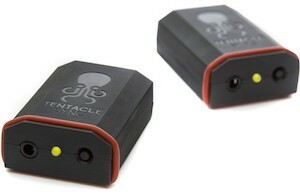 Tentacle Sync Timecode Generators are small, lightweight, affordable and very fast to setup. I really like how they have a built in microphone allowing you to still capture scratch audio, or to use a splitter cable and allow you to still input from an external microphone. Obviously using Timecode in your workflow will save you hours and hours in post editing when shooting multicam projects. Posted in dslr video. Tags: davinci resolve, multi camera angles, multicam fcpx, Premiere, sync multicam, tentacle sync, time code generator, timecode, timecode audio recorder on July 11, 2017 by Cheesycam. Great article, and video! What's the brand of the splitter? Ive been using these since day 1. Still work great! Regardless of whether it's wired, bluetooth or one time only is irrelevant... as long as it's one license per tentacle the same issues will arise.. Going back to the original comment I made, it's frustrating and ironic that Sony, Panasonic, Blackmagic and the likes don't read audio timecode (like the Sound Devices Mix Pre 6). Timecode is, in fact, an audio signal! It would be a very simple firmware based revision to implement. I guess a cobblers children have no shoes. Thanks for the great site and content. @ilovepasta2020 - The new version of their product (recently demoed at NAB) will now have bluetooth, so you can configure it without a cable. In my circumstances, the number of production companies I work with outnumbers the amount of Tentacles I would ever own. Also, I hand off my files to a DIT after the shoot and hopping on their computer and/or being given a copy of the video files to sync is unrealistic and asking them would be unprofessional in that environment. Again, not trying to dissuade people from getting these (on the contrary they are a great product for the money) but just pointing out my experience using them for people that might be in a similar situation. One other question: I had these when I had an iPhone 6... now I have an iPhone 7 Plus (which doesn't have a headphone jack). Will the app work with the lighting to headphone adapter? Thanks again for the prompt and in depth replies. @ilovepasta2020 - Yes only one license per TS, but you can remove the license from a machine and then add it to a new machine. It's very much like Adobe cloud software. Considering you'll always need more than one, there should be enough licenses to go around. But even still, once you export the XML part, you don't need the software. So it could be done on any laptop computer and then just email the tiny project file. Other production companies don't need the software after you've generated the XML file. Thanks for the reply. They must have updated the software as it previously required tethering. Regardless if you don't need the device tethered after the first license pull, you still only get one license per tentacle (from what I could gather from your video) which makes it awkward working with other production companies. In my experience, if you are present in post-production or work on a casual / frequent basis with a production company, by all means get them! They are affordable, stable and streamline the post and syncing process. @ilovepasta2020 - Either they've made an update to the software, or you were using it incorrectly. You do not need to have a device attached to the computer for the software to work. I even show in my example how you pull a license down to the software to activate it. Once you do, you don't need the device attached. I'm a Sound Mixer and I'm happy to see a post about timecode and sync. I have owned (and returned) these units after extensive time in the field. I use the Betso SBOX 1N as my primary timecode boxes but picked up the Tentacles for shoots where there were multiple DSLR's in addition to the primary, higher end cameras. They always had solid timecode and were especially great for events where a bunch of videographers were roaming around (especially in different acoustic environments) and as always for events where quick turnaround is required. In order to use the software, you need to have a Tentacle hooked up to the computer. This is fine for personal or in-house work where you will be doing the editing and indeed streamlines the syncing process. However, when you are working with other clients it can come off as a bit unprofessional in my opinion because (a) you have a screeching timecode signal upon reviewing the clips (b) you have to explain third party software (c) you have to have a unit connected to perform a sync. Again, if you are in control of and will be present in post production or work on a daily basis with your producers and can walk them through the process than by all means I suggest them. From a design standpoint I would like to see: locking 3.5mm jacks to prevent the plug from being pulled out, a hotshoe mount accessory as opposed to using velcro. The other drawbacks which are stressful for a sound mixer (not being able to see the timecode, non-replaceable battery) I am okay with as that is what keeps the price down. I know they seem expensive to videographers but the next best thing costs twice as much (though admittedly has more features). Lastly, I wish SONY, CANON, BLACKMAGIC and PANASONIC would incorporate timecode into DSLR's. It would be nice to minimize all the auxiliary clutter and to streamline and improve the quality of post production workflows. At the very least they could implement a timecode read function akin to the Sound Devices MIX Pre series that could be fed by something like the Tentacle Sync. @Petter Sand - This is the one i'm using. It's very secure with just one knob, is fast to put on and take off (when packing away), and has several mounts and a cold shoe. Hi Emm! Thanks for your good work! I realy appriciate it. I notice that you have added handles to your ursa minis. What brand is IT? @Kevin - When you are using timecode via audio, it does not change the timecode stored in the metadata. It just uses the audio to sync in post, but the sound is real LTC. Proper software can read the exact hour, minute, second, and frame of the video file. If you want to store the Audio Timecode into the metadata, I believe you can use their software to export a new version of the file with the metadata updated to match the audio TimeCode. Thanks for the overview. I am unclear however about whether or not the tentacle sync utility changes the timecode of the clips when it processes the timecode over audio or just syncs them? Very interesting product indeed, but very pricey. This should be priced at $99 or below if they want people to widely adopt it. @Satva - This is not limited to FCPX. The same workflow will work in Premiere, and Davinci Resolve can do multicam editing too. @Chris K. - You can set the volume of LTC as it's set to one side of audio only. The other side is normal recorded audio. When using the splitter, plugin power is still available. I've tried this with a lav mic to a Zoom H1, and the lav mic still works, hence plugin power is still available. So it should work with your videoMic Go. Wow this is really cool! Thanks for the tip Emm. Multicam is tricky and this seems like a nice solution along with FCP X. Very cool, thanks Em! I'm curious if this works with the plug-in power, I use a Rode VideoMic Go on my GH4. Also wish LTC audio had an option to be at a very high or very low frequency so you could still record audio on that channel and filter out the LTC signal. Please note that Plural Eyes "stretches" the audio when it syncs up multiple sources. This is a major problem for music videos, when the primary audio source is the focus of the video -- such as a 24/96 soundtrack. When you have multiple audience floating cameras... you want to "stretch" the video to match the high-quality audio source, usually coming from a soundboard. So when you have a high quality PCM audio source in your project, Plural Eyes is useless. This product appears to be a good solution for mult-cam music videos, especially when you have roaming cams without timecode.